By utilizing our suite of advertising analytics tools, clients are able to leverage data at every stage of a campaign to inform programmatic activity and make smarter, faster business decisions. We provide an enterprise-grade solution that delivers real-time information on the health of your programmatic sales and actionable competitive insights so publishers can identify new revenue opportunities quickly and make immediate decisions for a positive impact on their results. 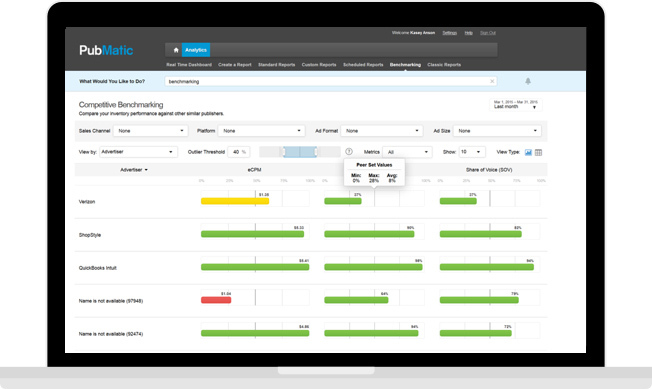 Now advertisers can make smarter decisions with real-time intelligence, visibility into campaign performance, and easy-to-use reporting that result in increased return on ad spend. We also make available detailed information on the success of advertising tactics across ad formats, channels and screens. Buyers can leverage premium first-party publisher data to reach their target consumers with our tightly curated display and video audiences. With multiple Private Marketplace (PMP) offers all under a single deal ID, media buyers can segment and target audiences in premium environments, at scale. Sophisticated benchmarking service compares performance on key metrics (i.e. eCPM, share of wallet, and share of voice) against publishers in the same vertical or category. This real-time data and analytics enables our clients to identify areas for improvement, such as pricing up-side opportunities, campaign effectiveness, and new advertisers. Providing publishers and buyers with the data to drive smart marketing decisions. 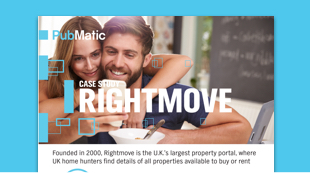 At the start of 2015, Rightmove was searching for a partner that could increase its fill rates to drive revenue growth. Displaying advertising from non- real estate brands was a new strategy and needed to be approached with caution.